This warm weather, then cold weather then warm again has left me rotating my products like crazy! So rather than make this post a million years long, I thought I'd just feature my absolute favourites I've been reaching for again and again. Make sure you check out my review links for more details. Without further ado. I can't get enough of this primer recently! This is a hydrating primer that leaves my skin dewy and fresh. It smooths over any dry patches and my makeup applies really well over the top. I don't think this will be for everyone because it's so hydrating and dewy but I love it. For foundation I can't put this down. This is a newly reformulated version that offers full coverage and promises to be long wearing. Which this is. I love the finish of this. Only it has a natural satin finish but with the Back to Basics primer it looks so nice and glowing. I've recently gone back to my trusty Hourglass powders. Nothing compares to these. I have the Ambient Lighting edit which houses a trio of powders in 3 different shades, depending on the finish you want. I personally just reach for Radiant Light to set my makeup. It sets my makeup in place but gives my skin a lovely lit from within glow. Nothing to over the top just a natural radiance to the skin. I really struggle with powders drying my skin but these don't do that at all. For concealing my dark circles Shape Tape has been my favourite. It's just the most full coverage, natural looking concealer I've come across. It never creases or cakes up. At first I wasn't to keen on this because it wasn't brightening enough for me but I got a lighter shade and it works brilliantly. To contour my face this bronzer from Anastasia Beverly Hills has been my go to. I have the shade Rosewood which is the perfect shade for creating shadows on my skin tone. The formula is so buttery, it applies beautifully and stays in place all day. This little highlighter palette from L'Oreal is by far one of the best drugstore highlighters I've come across. The formula is not powdery at all. They are so soft! They don't have any glittery or chunckiness to them either. The far right shade is my favourite. It's a really pretty Champagne colour. I've been really enjoying this blush lately. It's a really pretty Coral shade, that has a Goldness to it. But not in a shimmery, or glittery way. I can't really describe it. But it looks beautiful on. It really lifts the face and makes me look alive. The formula is really soft. It's pigmented but not to pigmented it's easy to go overboard. It's an all round winner. This mascara actually really surprises me. I don't tend to like high-end mascaras or ones with regular bristle wands but I love this! It adds amazing length and volume. This has also been reformulated to prevent smudging. And I confirm this doesn't smudge at all on me. It stays put all day. It's become a staple in my routine. I haven't included lipstick or eyeshadow because they're the same as last month. Sorry to be so boring but if you're interested you can read lasts months here. Have you tried any of these? 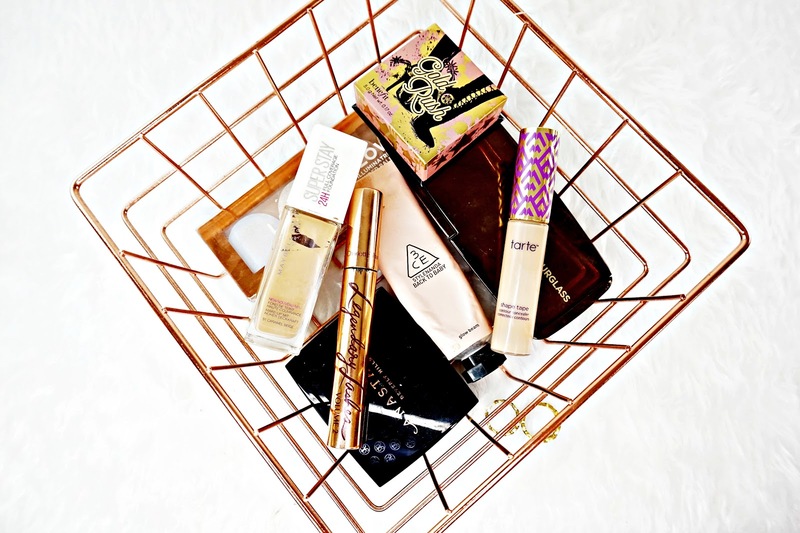 What makeup have you been reaching for lately?